Go to the Mother tree to get the quest. She will send you looking for the Fairy Princess. Just southeast of the Mother Tree there is a similar tree with a fairy. Get ready to fight. Click on the fairy. If you get teleported to a cave filled with Dark Elves, you are in the wrong cave. Teleport away and try again. You know you are in the right place if you see Spirits and not Dark Elves. Kill Darkmar, who is among the Spirits. He can cast Eruption and Call Lightning. In addition, his Spirits will help him. Once you kill him, you well get a Cursed Spirit Scroll. Return this to the Mother Tree. The Mother Tree will give you an Elven Treasure. Double-click on the Elven Treasure and it will become Spirit Crystal (Summon Lesser Elemental) and Elven T-Shirt. The Elven T-Shirt is AC 0, can be safely enchanted to +6 and is usable by Elves only. You must be level 40 to learn summon Lesser Elemental. Lindalas, Ken Server: Once you are in the cave with the elementals, use random teleport to move around until you find Darkmar. ONLY fire on Darkmar and don't bother with the elementals! 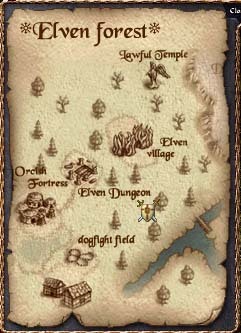 Anakinn, Dep Server: You can tell which cave the Fairy will transport you to by carefully reading the text of the Fairy Princess. The version with the extra word (on the left) will transport you to the Dark Elf cave. The shorter version (on the right) will transport you to Darkmar. Unknown: There is a small crevice in the cave where you can corner yourself in and only a couple of spirits can get to you at once. From there, it's easier to hit Darkmar.